I’m very excited to be helping the International Society of Experimental Artists (ISEA) to bring their Annual Juried Exhibition of Experimental Art and their Annual Symposium on Experimental Art to Canada for the first time in September of 2020. The first important milestone, an agreement with a northern Alberta gallery to host the exhibition has been completed. Stay tuned for the official announcement of the gallery later this year. So this exhibition and symposium are coming to Alberta in a little less that two years! We’ve established a small local organizing committee for the event. If you are interested in getting involved in that committee, please contact me directly and I will provide the details you need to decide if this might be a good experience for you. “Consonance and Dissonance” above is an experimental mixed media work, with collage of altered papers, poured acrylic skins, and directly applied acrylic paint. I’ve used techniques and materials that began as experiments in prior works, as well as a style that began as an experiment in re-envisioning Canada and the Canadian Flag in 2017 for the 150th anniversary of confederation. 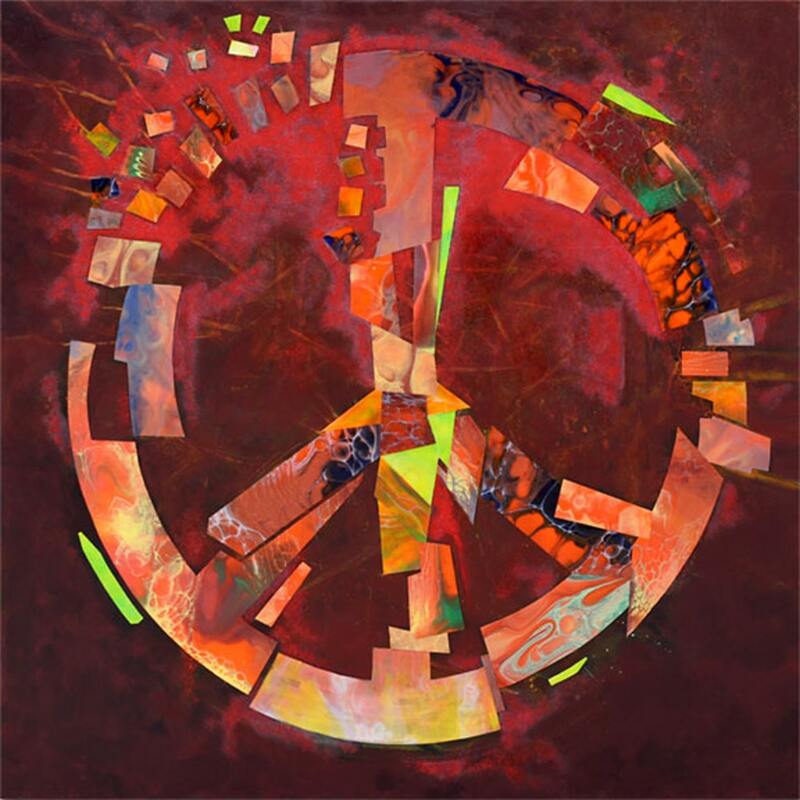 The peace symbol seemed an excellent source of inspiration, as it is universally understood, and since peace is always in a pendulum-like cycle of deterioration or reclamation. We usually think of peace, as represented by this symbol, as an international ideal between nations, the stereotypical goal of beauty contestants, but peace can be national, locale, community, family, or personal in nature as well. No matter what current state we are in the concept of peace always remains a beautiful ideal. For those of you interested in more information about the ISEA Annual Symposium in 2020, stay tuned for more information on my website, or via other social media. And to find out more about the International Society of Experimental Artists, please check out their website.